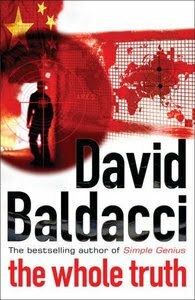 David Baldacci’s THE WHOLE TRUTH has a plot that would be perfectly suited to a James Bond film: the head of a major arms vendor is plotting to ignite a new Cold War by manufacturing a conflict between Russia and China through a campaign of disinformation and murder. Secret agent Shaw becomes involved when his fiancé is one of the innocents killed, and so he teams up with an alcoholic reporter – inadvertently drawn into this whole mess – to dismantle the arms vendor’s nefarious plans. So, the plot’s not outrageously original, but regardless, has the potential to be the foundation for a solidly entertaining novel. And that’s what THE WHOLE TRUTH is; a somewhat formulaic action romp; a thriller that doesn’t always thrill, but provides a few hours of entertainment. Baldacci’s prose is incredibly readable. His words flow. He doesn’t litter his narratives with memorable lines or particularly punch dialogue; he’s just an effective storyteller, and demonstrates this time and time again. THE WHOLE TRUTH is an easy read. It’s not especially intricate, but I suppose it’s not trying to be. The problem is, there’s too much exposition. Too many scenes feature the protagonist or the villain deliberating over their actions; quite literally breaking down their reasons for behaving as they are. It occasionally felt like Baldacci was hand feeding me, and quite unnecessarily so. As a result, sections of the novel lag. It doesn’t ruin the experience, but a slightly heavier edit might’ve streamlined the tale. The book’s other major flaw is its largely uninspired characters. There is very little to distinguish Shaw from a Jason Bourne or James Bond or Mitch Rapp. Which isn’t a huge issue – these kinds of heroes only exist to push the plot forward rather than stand as beacons of deep, rich characterization – but it’s still a tad disappointing. That aside, the plot, for the most part, moves at pace, building to a conclusion that I’d expected to be far more spectacular than what eventuated, but was satisfying nonetheless. I finished THE WHOLE TRUTH satisfied with my reading experience, but not blown away. This is an enjoyable thriller – perfect for a daily commute – but doesn’t stand out in its crowded genre. Serviceable rather than outstanding.